At Accessibility Scotland 2017, Kiki MacDonald and Paul Ralph of @EuansGuide talked about the journey of building the disabled access review website, Euans’ Guide. They talked about some of the challenges and opportunities that digital accessibility had brought. Kiki: So a few years ago my brother Euan messaged me to say that a few friends, ex-colleagues of his, were coming up from London, and did I want to meet him and them for a drink that evening? Small challenge, Euan had recently become a manual wheelchair user. So I said to Euan, sure, but you’re gonna go. And at that time for him suitable access meant, meaning that you could get in the door, that there was an accessible loo, and, crucially, that people would actually make us feel welcome and not like we were a bit of a nuisance, particularly in front of his former colleagues. Remarkably, despite both of us having lived in the city most of our lives, we couldn’t come up with one suitable place to go that evening. So instead, we stayed at home. And we found by talking to other disabled people, other friends, that actually this was pretty standard fare. It wasn’t just about exciting things like going for a drink with friends, but actually navigating, for example, the post office, how we’re going to get to mail in the post office, can I get in, are they actually gonna make me feel welcome and help me do whatever I need to do? And we knew also, that these other disabled people had the answers to that question of where we could have gone that night. And so Euan and I, after that, embarked on what I would say was some pretty weird and wonderful accessibility experiences ranging from having been sold accessible tickets, accessible tickets, to an iconic music venue in Scotland, one of the most iconic music venues, to see a gig and finding we couldn’t even get into the space where the band playing so we were offered not an insignificant amount of money to go away and tell nobody about the experience. And then, strangely and foolishly, ’cause we were quite a lucky pair I suppose, given free tickets to a music festival. We thought we’ll give this another go, half expecting that we’d have to turn ’round and come home and find it was absolutely brilliant. And yet, there were no other specifically disabled people there on that day. So we wanted to share some of these experiences, particularly the positive experiences that we’d had, but more importantly, we wanted to hear from other disabled people, their friends, family members, carers, PAs, where were they going? Where was good? Where would they recommend? So we attempted to set up a place for just that. So this slide is some images of Euan on some of these weird and wonderful accessible experiences. Him at said music festival in pouring rain, but it’s back in here, um, at his beloved’s hips two fold grains and events. So that solution we tried to come up with was Euan’s Guide. So a review website that is pretty similar to other review sites, but reviewing and writing about accessibility and by disabled people and the people they spend time with. Some people say is it a sort of Trip Advisor for disabled people? In some ways I guess there are similarities but I would say it’s very much more and often about the everyday in your own time rather than going farther afield. When we started this project the concept of us traveling to a foreign destination was honestly beyond our wildest dreams. We couldn’t even navigate trying to get to a local coffee shop with a research project, nevermind the idea of going abroad. And maybe to point that out a little bit more as well, from the site and thing that people’ve been posting on the site Euan’s find this fantastic holiday accommodation place and he’s gone back every year, that place is 15 minutes drive away in Fife, and that feels exciting and luxurious. Yeah, some of the things that’ve come out of it. And some people write essays, some people write just a couple lines and a few photos. People can say whether what access equipment they were using, that’s volunteer but most people do so reviewers can say if they were, for example, a power chair user rather than a manual wheelchair user, if they’re using a walking aid, if they’re using a cane or something, etcetera. As I say it’s voluntary. But, I would say almost everybody writes, writes that on their reviews and that is hugely powerful so that the person who’s reading that content knows the context of, the experience of, the person who’s written that review. I would say that we were hugely, hugely naive when we got into this. And we thought wow, building a website, it can’t be that hard. Neither of us had any web or development experience, neither of us had any tradition training or knowledge of accessibility other than our own experiences and from talking to other disabled people and carers and friends of disabled people. We were driven simply by a passion, a belief that this would be helpful for people. I say naive because I don’t think we had even the faintest idea of how complicated this whole space is. And also how many people it impacted, it impacts. There are 12 million disabled people in the UK, that’s about 20% of the population. Nobody seems to talk about that, really. And one of our aims, secondary aims of the site is that accessibility becomes mainstream. And when it’s such a big part of society, or when people mainstreaming this. Um, yeah. And I would say we’re still driven by that passion, that belief that the site will be an aide, helpful to people, but we now have proof that it is. So users tell us how awful it is in Texture, but a really interesting part of that came last year which was we found evidence, people kept telling us that they were going to new places on the back of just one review. So I don’t know how familiar you are with other consumer websites, but normally review websites, people look for maybe a handful, maybe 15, 20, maybe more reviews before saying maybe hey I’ll try that out. And we’re finding that users of Euan’s Guide are reading a review that’s just a review, no brand new information, and they’re trying that place. So there’s something hugely trusted about that content and something about it’s more powerful than even normal user, normal, other user content. That there’s something of this set of community, or reading about somebody in a similar situation to me. And I know that from my experiences with Euan that if we knew another power chair user had been to Bob’s Coffee Shop along the road, we would think, oh, yeah, he says it’s good, yeah, we’ll give it a go. So that’s quite an exciting thing that’s coming out, I may be simplifying a little bit, but yeah. So what’s the next slide? So, yeah, here we are now, today, almost four years old and we have almost 6,000 places on the site across 51 countries, most of it, almost all of it in UK. And that’s nice, but we’ve only really got started. We’ve got a massive amount of job to do to get much more content on the site to make it the really powerful knowledge bank it could be for people. We have an ambition that every place on every street is reviewed so that you can use near me functionality on your phone and find somewhere, you don’t have to be doing research every time you plan to go somewhere. We’ve got a long way to go and we need a lot of help with that, so do come and chat to us if you can help us. We also got a growing offline community as well, so we say Euan’s Guide is a place for people to share their experiences of accessibility, to find great places to go, but also take part in what is a growing community, and get involved. And, yeah, this is just this side Scott, a couple of quite random pictures. One of Euan hanging out down, of course, Courseville Beach. I was really just putting this slide up because, just to show that Euan is now a Tobii Eye Gaze User. So you’ll I imagine you’d expect us to take digital accessibility and make it the core of what we do, given what we do, and the use of it we have, but also a number of people in our team use assistive tech so it’s very natural for us to think of digital accessibility through everything that we do, from designs to development to testing. Testing is a harder part. And the one thing I’d say on that is, that we’ve always taken digital accessibility with a view, rarely thinking about standards really only thinking about user experience. And for us, we feel sometimes that gets lost, particularly with perhaps, bigger organizations where they think I’m meeting standards, the stuff’s fine, right? And they haven’t actually tested it with any assistive tech users. And, for example, we would usually say that so often in the physical environment, some where can be technically accessible, but the user experience is terrible. So it can meet all the standards, and it’s a complete nightmare. Anybody who’s maybe tried to navigate as a manual chair user onto a standard bus marking and a bus face, we’ll tell you all about that. Or perhaps an accessible loo that’s actually filled with things and nappy changing bins and what have you which makes it completely redundant. Early on into, I’m gonna hand over to Paul. Early on in our journey we met Paul through Twitter. I think about a day later we met, and a few hours later he became a core part of the team. Paul runs all of what we do accessibility wise and digital accessibility wise, as well as a number of other projects on the team. So I’m gonna hand over to Paul, just a sec. Paul: I’ve always wanted to do this: testing one, two, three! It’s scary, actually, being in a room this size, I was sitting over there thinking, this’ll be fun, but now I am sitting in the sun. Okay, it’s absolutely fantastic to see such strong interest in the world of accessibility. I’m kind of going to try and take us on a bit of a journey. Some of this is very spontaneous, so you’ve kind of got to go with the flow a little bit. I’m of an age where I can recall a time where accessibility didn’t have a higher profile and disabled people weren’t expected to be playing around with technology and the internet and apps. Well some of that didn’t exist. It was a time when nobody would have imagined the coming together of so many platforms to bring about an incredible, then unimagined, set of opportunities that would so enable, and so empower disabled people. Back then, long time ago, people weren’t talking about using simple colors, writing in plain language, describing images, following logical layouts, keyboard only working, good contrast, aligning text, big buttons, captions, shortcuts, or any of that stuff many of us would be familiar with. It was a time when the internet wasn’t born. The closest you got to digital technology then was actually the electric type writer. Oh how things have changed. I want to spend a few minutes talking about accessibility, and some of the learning encountered, by what I would describe as the Euan’s Guide Journey. I have to warn you, I’m speaking from notes. I’m quite prone to dropping them, so there might be a pause there, I don’t propose to use any graphics or illustrations because that way I can be more spontaneous. I’m not tied in to follow something that’s happening behind me. That’s kind of how it goes, try and do this. 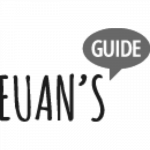 You’ve heard about Euan’s Guide, you’ve heard a little bit about the journey. The other thing shout at me if the sound drops, because I’m likely to actually get tired on the left-hand side, the microphone decides to go, “Whoa!” I want to build upon that journey. I want to build upon that story. And in the spirit of good old fashion story telling, I’m going to share some stories. Each of my stories, I have seven stories. And I want to kick off with something that people don’t often talk about. They talk about the practicalities of inclusive designs embracing, which is great. It’s unusual sometimes, to actually hear about what does digital accessibility actually feel like. So my first story, really, is about the time when Team Euan’s Guide were planning a night out to celebrate a night out to celebrate someone’s new job. We chose somewhere we thought we would like to go. Strangely, being Euan’s Guide people, we didn’t use Euan’s Guide to find out somewhere to go. Because we heard about this up and coming, new trendy, sort of place down on the shore. And sometimes you kind of want to do something different, and something a bit new. So, it seemed like a good idea. The plans were going well, until the recognizance phase. You see, because it was somewhere that hadn’t been reviewed, and because once in a while you want to try something new, we discovered it had a step. It may, in some people’s minds, be only a simple five centimeter step, but it was a sufficient size and caliber to stop my power chair and other colleagues dead in their tracks. Imagine how it feels when you get quite excited about joining in the fun. And so, you want to be part of it. And all of a sudden, five centimeters gets in the way. And you see, digital accessibility can feel like that sometimes. Sometimes the website’s not clear on it’s intent. It might not have a range of contact options, and the only one it’s offering you one that is totally inaccessible to you. So you can’t ask questions. It might be a site that lacks structure or consistency. So in a way, it’s kind of the digital equivalent of that five centimeter step. One thing I can tell you is what it feels like. It’s very much like the five centimeter step. It sends a really really clear message to me and many of my friends. So, you see, lesson one in the Euan’s Guide Journey, is to understand what it actually feels like not to get into somewhere, and not to be able to use the website or an app. My second story is around a notion of perception. Many years ago, sounds like a history lesson for me, back in 2007, longer than I choose to remember, my friend Ian and I, point to note here, Ian happens to be a vision person, we set up social enterprise providing website and graphic design services. At the time, we were quite unusual, because we were a community interest company that employed a team of talented disabled people to do different services. We had lots of customers, and we had many potential customers coming through the doors, we’ve won awards, we’ve worked with some high profile clients, and quite honestly had a great time. What was really interesting during this time was our customer’s interest in accessibility. Or more specifically, their perceptions of accessibility. Sadly, from our point of view, most of those perceptions we encountered very often are seen still today, 10 years later. You see, we encountered many folk who thought that whether accessibility was just about vision impaired people. I want to expand on that. I asked you to think about the building environment. Because it’s a bit like saying that access is all about nice big concrete ramps and big lifts for wheel chair users, that’s all very nice. But, what about folk don’t see so well? What about the people with hearing impairments? What about those folk with dementia? What about the ambulant disabled people? For us, it was an opportunity for members of our team to explain and sometimes demonstrate how rich, deep, and inclusive accessibility can be. It was a surprise to many customers, as we never mentioned that their website may be designed by someone who is registered blind, or their graphic design put together by someone who doesn’t use a mouse or a keyboard. So, you see lesson two of Euan’s Guide was to talk to the potential audience and find out what their expectations of accessibility were and continue to be. I wanted to call this Before or After. I’m reminded so often of the many modern buildings I encounter where the notion of design and inclusive design has been overlooked. So much so, that you encounter a quick bouton of a platform lift here, a couple together ramp there. That always becomes the norm. Not always a great solution. Often never tested with disabled visitors, and perhaps not really suitable for the job. The world of accessible websites sometimes feels like that. Many a time, when I and friends have sat and looked at a website and had a conversation around their accessibility, so much so, it’s almost like a new game. So I can recall as a child having a small, pocket-type of books, I think they were known as the eye spy books. And the idea was that you use them to take off things that you’d seen, so that they’re eye-spyable for when you went on train journeys. There’d be an eye spy book for when you went to museums, or when you went on a car journey. And I kind of, along with friends, wondered, perhaps it’s time for a new eye spy book. It’ll be the eye spy book of websites. And imagine the things you’d have to find. Can you find the images with no descriptions? Can you find them, buttons with too little contrast? What about something that you can’t get at with a keyboard? And so, it goes on. So you see, there’s really two ways of looking at accessibility in my world, and my friends’ world. There are, what we would call, the retro fitters who see accessibility as something that you do because the law says it’s a good idea. And it’s more seen as a compliance exercise than any thought out planned strategy. And then, there are those that give me and my friends great hope, as we see that they quite clearly embrace accessibility and inclusion, and build it into everything that they do as a matter of cause. And I kind of have this sense and feeling, and I’m quite happy and excited, because I guess there are quite a few of those folks sitting in this room. And so you see, lesson three of Euan’s Guide was to build accessibility into our website because we wanted to, and not because the director said we should. Thinking randomly, since I really want to be random, I want to talk about Pelican Crossings. Here we are in the world of accessibility, and I want to talk about road infrastructure. Really, really, topic for Edinburgh, but we won’t go down that route. Ian, my vision impaired friend, and I had long, and deep, meaningful debates about the idea of people calling things fully accessible. Pelican Crossings, Pelican Crossings, sometimes get described as fully accessible. But they too, have their challenges. Ian, as a vision impaired person, loves the tactile services and audio feedback. He knows where to stand, and he knows when to cross. On the other hand, for me as a power chair user, I don’t really like the tactile surfaces because they shake my chair, which in turn shakes my spine, and so it’s not really a great experience for me. So I wouldn’t really describe Pelican Crossings as fully accessible. Take that example, and migrate it across to websites and apps. Sometimes when you do something to enhance the accessibility, you can create barriers for others. I kind of have a sense someone is going to ask me, wait, what do mean have you got an example. So I thought I’d just check something in we should do. In Ian’s voice over, or what we use through text to read his screen to him, all the components of the screen that he wants read to him, the length of the content of the page, in his world, is significant. Too long, and he may not stay on the page. So in his world, short, snappy, well-structured content spread across different pages is fabulous. Whereas, miserable old me, uses voice command or control. So for me, the minimum number of jumps between pages, buttons, controls, et cetera is significant. So for me, the content rich pages, I love them as long as I can possibly have them. So you see there’s a little bit of a conflict going on here. In Ian’s world, drop down menus, can be . . . He described them as being quite verbose sometimes, ’cause people do these high optical menus where you have to wade through them, put them in the screen, read them, and then three blocks and everything else, and that’s problematic. In my world because I’ve got to be able to know what it is, it’s a cognitive thing, if I can’t see it on the screen, I can’t click it because I don’t know it’s there. And I don’t go exploring. So, there’s something else going on there. So you see, there’s this real dilemma. You’re trying to create something that’s 100% for everybody. Forget it, it doesn’t exist. I’m going to stop there, because I know I’m open to challenge there by saying that. But, that’s the real world. I’m a realist, so we do our best. So, lesson four of Euan’s Guide journals, was to understand that sometimes the things that you do to increase the accessibility and inclusion can have an impact on that very accessibility that you tried to create. I’ve lost count of my stories, but the next one. I want to talk about putting people in boxes. I’m quite passionate about this, but I’ve liberty adlib bit ’cause I could give a whole theater on this one. In this world of the accessibility thing, whatever that is, I kind of have this view that people often think sometimes their thinking is framed by impairment or long term condition. And I strive to encourage people, yes that’s great. But, also start to think about functional ability. I say this, because, we see so many websites that adopt the one size fits all approach. And so, they’re lulled into thinking about a specific impairment and so they do some accessibility work around there and it distracts from them taking, perhaps, a more holistic, inclusive, view of the accessibility. It would be encouraging, developers and designers, to think more about human function and human interaction, then they perhaps currently do. How people approach that, I’m not quite sure. But I’ll share with you the way I tend to think about it is in four segments of human function and human interaction. Vision, hearing, physical and motor skills, literacy and learning, and if I kind of think in that quadrant of things, it kind of provides a good starting point to the framework. So lesson five at Euan’s Guide Towers is avoid falling into the trap of building accessibility for specific conditions or impairments, but to look more closely and human functions and interactions that may prove challenging for people. I go on a bit, you might have noticed. Shop window or stock room was my next flavour. I wanted to call this Shop Window or Stock Room, and here’s why. Sometimes people focus on the accessibility of the front-end of their website or their app, with the perception being that’s where disabled people are going to be found wanting to come and visit, come and play, come and enjoy, et cetera. I simply have a word of caution. Although, I’ve scribbled that out of here and I’ve actually changed it to: perhaps its a word of encouragement. My word of encouragement is not to forget about the stock room at the back. There are some amazing, talented, coders, designers, programmers, and techy folk out there that just happen to be disabled people. If you’re going to create something that’s fabulously accessible, then make it accessible to those people involved in the process of creating it, aka the back office, ’cause you just don’t know who might join your team. So lesson six at Euan’s Guide towers was to build accessibility and inclusion into our work, but make it integral to absolutely everything we do and think about. For us, one of the most critical errors that Kiki spoke about earlier is, what I call, Testing and Trial. We’re reflecting on the Euan’s Guide story and the journey, I can’t close without mentioning the testing that goes on. We’re constantly tweaking things as is the way, and each time this happens, there is an ever-growing testing process. There are tools that might be used. There are volunteers that get involved. There are disabled people that get involved, and there are access technology users that get involved. It’s a day or two of hands-down, loads of donuts, plenty of coffee, and let’s just see what happens, see if we can break this new build. I mean, that’s what it feels like. But occasionally, things don’t quite work as planned. Now and then, we meet new users who feedback on what their experience was like, using their specific technology or tools, new ideas come forth, suggestions are made. And so, the journey goes on. So lesson seven, the last of my lessons, was to test everything with as much as you can, with as many folk as you can, and with as many real life users as you can. And when you do that, don’t assume it’s all gonna work just fine. One thing we are sure of is that the Euan’s Guide journey continues as we develop the accessibility of our work, and this technology, the digital world, and the aspirations of users changes and grows. So, I’ll need to keep the pace will change and grow. One thing we have come to learn, although we did have some insides of kind of a sense a bit, is that the digital world, and particularly the Internet is one of the most accessible forms of delivering information to everyone. And so, with this snapshot of our story and journey, I’m going to bring my story-telling to an end, and leave you with three key recollections from our experience. The first, users don’t always do what you expect, and nor do we. Users don’t always interact with technology in the way that you perhaps might imagine. Users can find technology in the accessible digital world, to be one of the world’s most impairing and liberating experiences, and so do we. And on that note, it’s simple. Thank you for listening to my stories. I’ll hand it back to Kiki. I think that’s it from us, other than if you have any questions. And lastly, we just got contact details up on the slide so do get in touch if you’ve got anything else you want to chat about afterwards. Yeah, it’s just to load Euan’s Guide Thank you very much.